Pennies Can Help With Bee Stings and More…. Can a Penny Help With Bee & Wasp Stings? Ever hear the phrase “See a penny, pick it up, all day long you’ll have good luck”? My children’s grandma used to say that phrase all the time when we were out walking together and she would find pennies everywhere. My children loved the game and would be looking all over for their lucky penny. 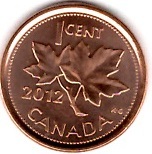 Now in Canada with the discontinuation of the penny it is getting harder and harder to find those lucky copper beauties. Make sure you keep a few though because sometimes they can come in really handy. I cleaned a few of my old pennies and put a couple in a plastic bag with some band-aids for first aid use. They work really well on Bee and Wasp stings. Wasp And Bee Stings Can Be Very Painful! Just scrape the edge of the penny across the sting to remove the stinger then place the penny on top of the sting and cover it with the band-aid. The copper in the penny counteracts the sting taking away the pain and by the next day you should barely be able to see where the sting was. If someone is allergic though they may still need to seek medical attention. I tried this method out on my son when he got stung by a wasp we were both surprised how well it worked! Now I have penny bee sting kits in all my beach bags, purses, car and kids back packs so we are always prepared. Putting a penny and a pinch of sugar in a vase with cut flowers will also help keep them fresh longer. The penny helps keep away the algae and the sugar will help to feed the flowers. I have heard a couple drops of bleach will do the same thing as the penny but I think the penny is better for the flowers. I have a container full of pennies that I keep for various uses. My children have used pennies as game markers and when playing card games, counters for math problems at home and at school (my son’s grade 1 teacher had each student bring in 30 pennies in a small container to keep in their desk for use when they were studying math) and art projects – as part of a collage or one of the 100 days of school projects. However, I still think the best use for a penny is on a bee or wasp sting and they are worth keeping around for that reason alone if nothing else. My Child’s Art Work…What can I do with it All? More Pictures! Where Will We Put Them? 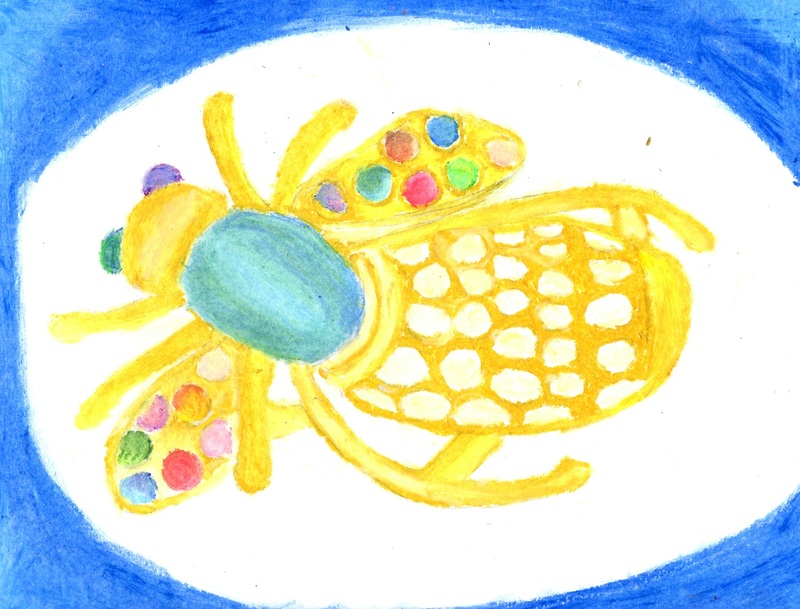 Kids produce a lot of art work especially from preschool to grade 7. 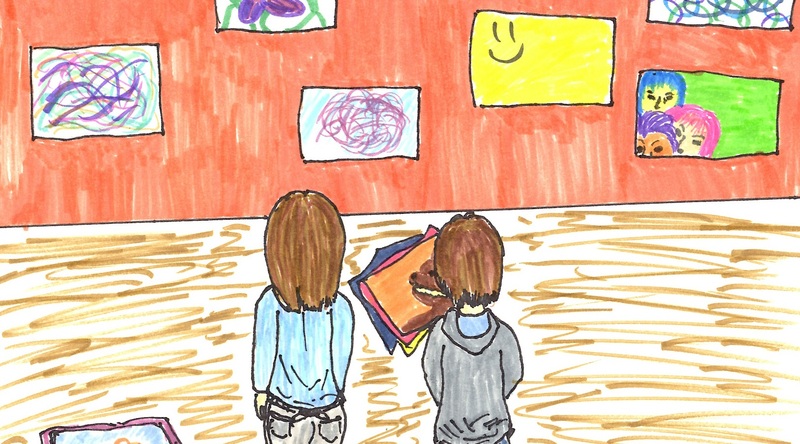 If they love art and take extra classes after school there is even more! Each piece is so precious we hang it on the fridge or pin it to a wall until our house feels devoured by paintings and drawings. Then when our child is at school and we can’t stand it anymore we rip it all down and recycle it hoping they won’t notice when they get home. At least that is what happened in our home. Sometimes I felt bad about throwing a piece away they had worked so hard on but we just didn’t have the room to keep it all. One year I tried keeping just the ones I really liked and ended up with a pile of dusty crumpled papers under my bed by the end of the year. It too went out to the bin. Then my oldest daughter Marie attended a week long art camp and came home with the most massive painting yet a 4’x4’ cave man painting. She loved it and I must admit it looked pretty cool but it consumed an entire wall. I really wanted to keep a memory of it so, prior to sending it to the bin I hung it up and took some close up photos of it framing the entire photo with her picture. Turns out that was the best idea yet! From that point on we started taking pictures of all her art work. If the pieces were small enough we could scan them in and get a really clear copy. She didn’t feel so bad when it disappeared because we always had a picture of it she could look at. At the end of the year we had quite a beautiful collection of kid’s art work photos so we decided to print some off into Kids Art Cards and give sets out as Christmas presents that year. Her grandparents loved receiving the gift of homemade art cards and Marie was so proud to show them what she had been doing all year. Christmas Treats Always Taste Better When Made With Love! So many families these days go to the store and buy all their Christmas goodies. The packaged treats in Grocery stores and bakeries make it far too easy for busy families to purchase their Christmas baking and not take the time to make it themselves. It is worth the effort to bake with your kids even if it is only one traditional family recipe. 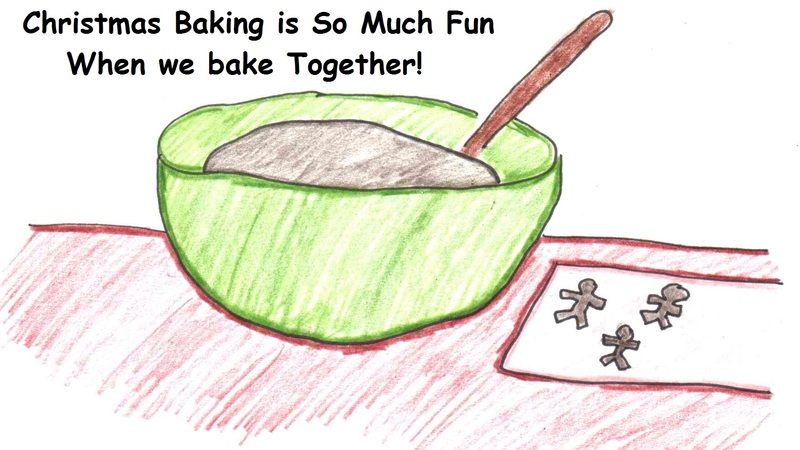 Children love baking with their mom and they learn so much in the process. They learn about family traditions, how to measure, mix, stir, bake and of course the best part tasting. They can learn scientific facts about the chemical reaction in baking powder and baking soda and how they make the dough rise. And best of all they get some quality time with mom, something they love any time of year. I do not bake a lot throughout the year but in December I spend a day with my kids baking some traditional family Holiday treats passed down to me from my mother’s family. My son doesn’t always have the patience for a whole day of baking but he loves to pop in and out of the kitchen and help with the stirring, licking the bowl and tasting. My girls have always loved helping out in the Kitchen. When my children were younger I would plan at least one recipe we could make together as that would be about the length of their attention span. They loved rolling out gingerbread or shortbread dough and cutting out the cookie shapes. One of their favourite recipes was making Nuts N Bolts. I have revised the recipe so many times I am sure it is different each year and before I can get any, my kids have usually picked out all the pretzels and cheese squares but it is still really yummy. 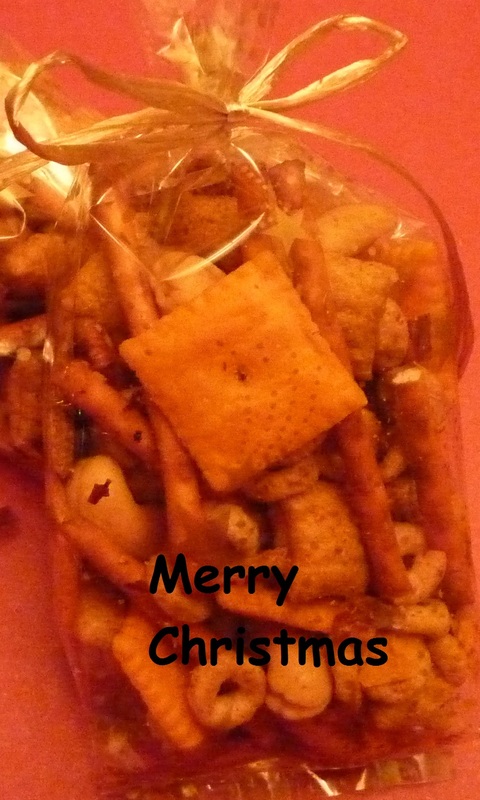 I have added extra pretzels and Cheese Nips in this recipe so I get some too. When they are packaged up these treats make great Teacher’s gifts too. Feel free to alter the recipe to your own taste as I did. Enjoy! Homemade Teacher’s Gifts are Always fun to Give! dry mixture while stirring to blend. (This step is easier done with two people one pouring and one folding and stirring) It takes about ¾ – 1 cup of liquid to coat a large roasting pan full of mix. You can tell you have enough when the pretzels get a slight buttery sheen on them and the mix looks slightly wet. Bake at 225° F with the lid on for about 30 min to heat it through stirring occasionally. Then continue to bake with the lid off for 1 hour stirring every 15 minutes until lightly brown and Shreddies with sauce on them are crunchy not soft. If you would like to cut down on the butter in this recipe you can mix it half and half with olive or grape seed oil instead. Half the fun is experimenting try using your own favorite cereals. What to do about a Christmas Tree when we are going away for the Holidays? A Great Alternative to the Traditional Tree! Going away for the Holidays and don’t feel like putting up all those decorations or just want to try something different this Christmas. Why not paint a Christmas tree on your window? One year when we were going away for Christmas instead of putting up our 7’ Christmas tree and dragging out all our boxes of decorations and lights my cousin and I decided to paint one. It was one of our most unique and memorable Christmas Trees ever. My kids made a few decorations out of construction paper and we picked up some candy canes to hang on it. We even put up some lights to make it more festive at night. Then we painted the rest of the windows in the living room with stockings and snowmen. 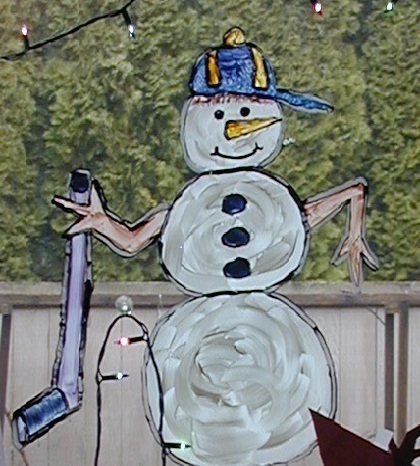 It was great fun and to this day the kids still want to paint the windows for Christmas. A festive Snowman to make any window brighter! The tree was really simple to do; I made up some paint using tempera paint powder, water and a bit of dish soap. (The soap makes it easier to take off the window later). 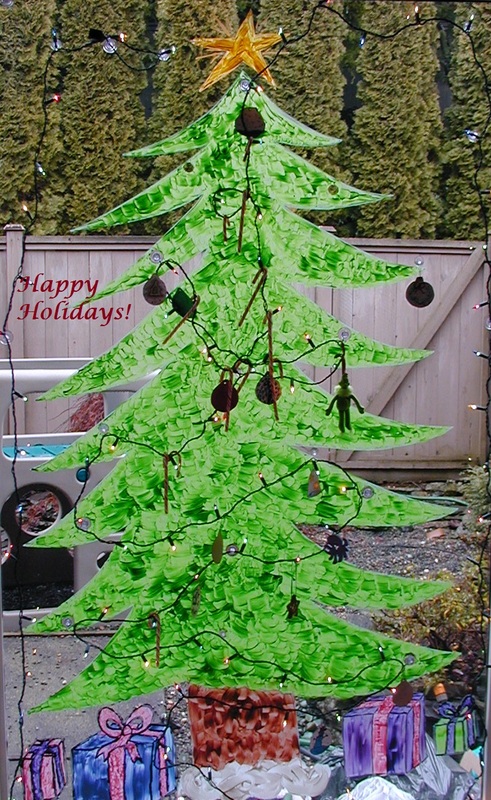 You could also buy window paint at a craft store but it could get expensive as you will need quite a bit of it.We drew the outline of the tree on the window then arranged suction cups for the lights within the tree. After filling in the tree with paint and painting the rest of the decorations on the windows we added the Christmas lights and hung the homemade decorations the kids had made on the suction cups and light cords. The kids had lots of fun making decorations and when we got back from our Christmas Holiday we just washed the windows with some wet paper towels to take off the paint. It was a great alternative to spending the day taking down and boxing a bunch of decorations.